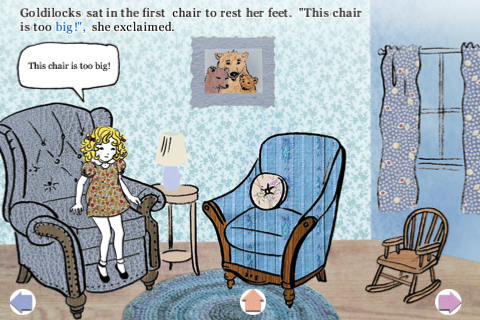 This book, for iPhone/iPad, is based on one of the most popular English language folktales. 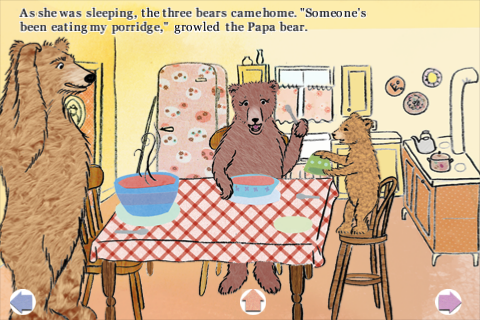 Goldilocks and the three bears has been beloved by many children and their parents for over a century, at least. When I went to get the itunes link for this book, I had to sort through dozens of other versions of Goldilocks. I have not seen them all, but this ebook is a nice version if you are looking for good storytelling with a tiny amount of animation. The book is not interactive, but sticks to the familiar version of the story in a way that young children will enjoy and older kids (6-10) might like as a book to read by themselves. The illustrations have a unique quality, similar to the other title by this developer, Rapunzel. The images are filled in with not only color but what looks like fabric prints, creating a neat 'patch-work' quality that is very visually appealing. Goldilocks & the bears animate, sort of, during the story. But mostly they just disappear and reappear in another part of the page. The only real animation with multiple frames takes place on the first and last pages, where Goldilocks is walking to the bears' house or running away from it. I was disappointed that the "read myself" mode does not, however, allow for Goldilocks to walk to or from the house like it does in the "read to me" mode. The app was easy to use, with simple settings and easy page turning. The narration was also nice, although I found it to be a bit slow and 'breathy' at times. Overall this is a great title for a bedtime read. I'm sure many of the other versions of Goldilocks in the app store are interactive or animated, maybe they even have a game or two, but as a parent, I really appreciate a version like this for bedtime reading. It is more fun than a static print book for my son, but not so much fun that he won't go to sleep. It is also a nice distraction for my son on long car trips or on my iPod while waiting in line at the grocery store. "The Story of the Three Bears" (sometimes known as "The Three Bears", "Goldilocks and the Three Bears" or, simply, "Goldilocks") is a fairy tale first recorded in narrative form by British author and poet Robert Southey, and first published anonymously in a volume of his writings in 1837. The same year, British writer George Nicol published a version in rhyme based upon Southey's prose tale, with Southey approving the attempt to bring the story more exposure. Both versions tell of three bears and an old woman who trespasses upon their property. "The Story of the Three Bears" was in circulation before the publication of Southey's 1837 version. In 1831, for example, Eleanor Mure fashioned a handmade booklet about the three bears for her nephew's birthday, and, in 1813, Southey was telling the story to friends. In 1894, "Scrapefoot", a tale with a fox as antagonist which bears striking similarities to Southey's story, was uncovered by the folklorist Joseph Jacobs and may predate Southey's version in the oral tradition. Southey possibly heard "Scrapefoot", and confused its "vixen" with a synonym for a crafty old woman. Some maintain however that the old woman was Southey's invention. Other Apps from KwiqApps Inc.